Home » Bad Rap or Bad Rep – Which is Correct? If you have a negative reputation that follows you around and interferes with your ability to make friends or advance professionally, do you have a bad wrap, a bad rap, or a bad rep? The answer might surprise you, and choosing the correct version of the phrase might be the first step in improving people’s perception of your writing abilities. Other steps on the road to self-improvement include being honest with yourself and others, taking responsibility for your actions, and following through when you give someone your word. 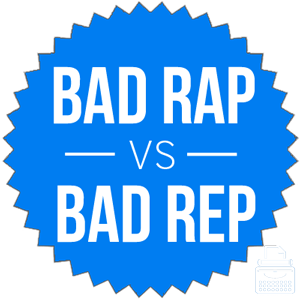 For now, though, let’s focus on choosing bad rap or bad rep.
What is the Difference Between Bad Rap and Bad Rep? In this post, I will compare bad rap vs. bad rep. I will use each of these phrases in several example sentences, which will give you an idea of how they should appear in context. I will also show you a mnemonic that helps writers choose either bad rep or bad rap. What does bad rap mean? Bad rap is a noun phrase. A bad rap is basically a negative reputation. In this phrase, bad is an adjective, while rap means negative allegations. The word rap has a similar meaning in the phrase rap sheet, which is a criminal record. Thus, a bad rap is an unflattering list of perceived crimes or misdeeds. “You’re going to get a bad rap around here if you don’t learn to clean up after yourself,” warned the foreman. Dale quickly earned a bad rap for going on too many dates and having too few honest conversations with his friends. You might occasionally see the phrase bad wrap instead of bad rap. This variation is incorrect, though, and you should avoid it. It obviously conjures up the idea of a sandwich, so unless you are eating a bad sandwich, you should avoid using bad wrap. What does bad rep mean? Bad rep is misspelling of the phrase bad rap. It probably stems from the use of rep as an abbreviation of reputation, and the similarity in sound of rep and rap. As easy as it is to see how this version of the phrase came into being, it’s less easy to see where it fits into actual usage. The chart below graphs bad rep vs. bad rap in English books written since 1800. As you can see, bad rap is strongly preferred in edited, published works. Since bad rap is the correct spelling, this is hardly surprising, but the chart provides a helpful illustration. These phrases are similar, but bad rap is the only accepted version, and the only one that sees frequent use in published writing. You should avoid bad wrap and bad rep.
Rap is a negative allegation, like in rap sheet, so as long as you can remember the meaning of that word, you will know that bad rap is the correct version of this phrase. Is it bad rap or bad rep? A bad rap is a negative reputation based on allegations of misconduct. Bad rep is a misspelling based on the phonological similarity of rap and rep, and on the use of rep as an abbreviation for reputation. 1 What is the Difference Between Bad Rap and Bad Rep? Goblin vs. Ghoul – What is the Difference?